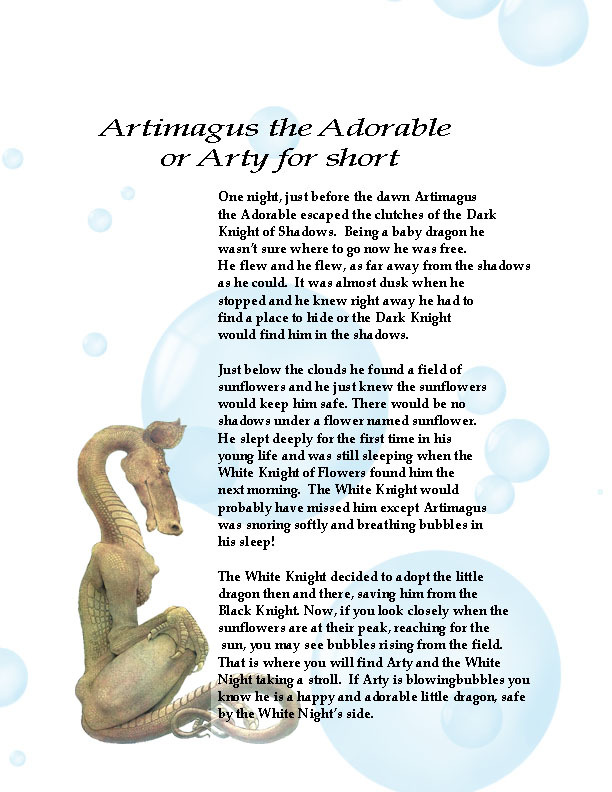 Arty is a little dragon who blows bubbles rather than breathing fire and is adorable. The White Knight of Flowers found him sleeping and blowing bubbles under a sunflower hiding from the Black Knight of Shadows. You can read his story below. The arm was scanned from an ad and the little dragon came from a free Dover image from an old storybook. Photoshop allowed me to make them one. This is Arty’s story. Before I had finished the piece he was whispering in my ear, telling me who he was and all about him. If you ever see a sunflower field, stop and watch for the bubbles floating by …. it will be the White Knight of Flowers and his companion Arty. Don’t forget to say hello. 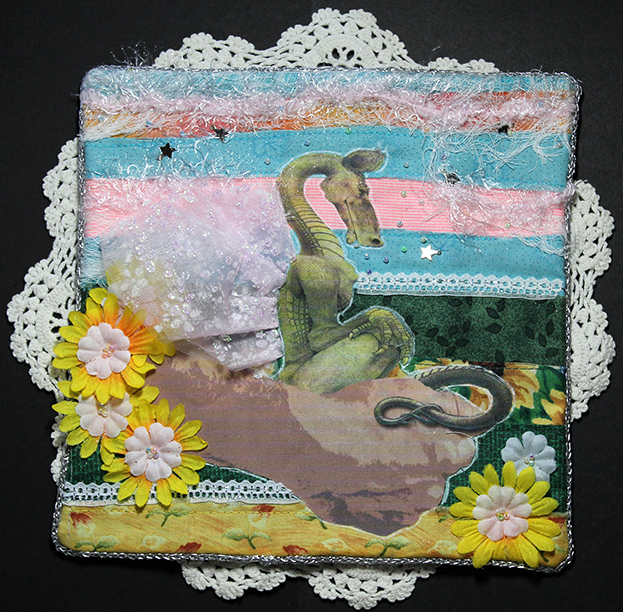 This little fabric collage was created for a swap on the Art For the Creative Mind Yahoo Group. If you like swapping and are working with mixed media come on over and take a look. The link is listed on the side links. 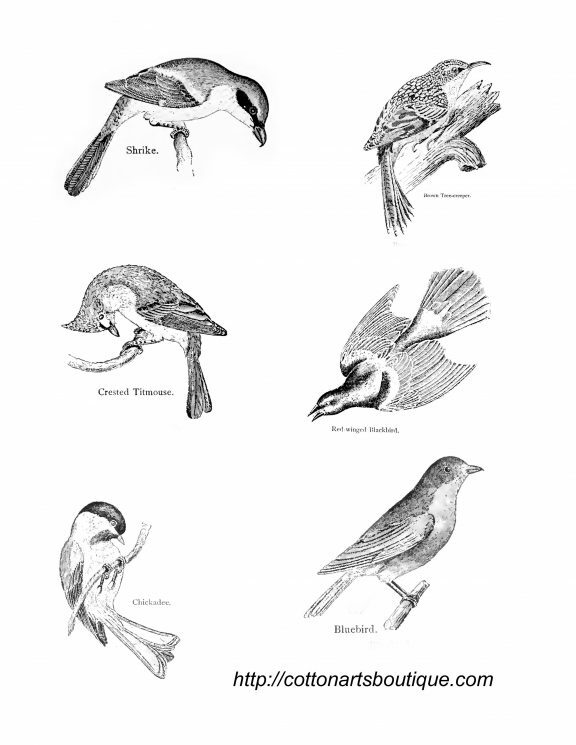 Here are some more birds, also taken from a vintage bird book … I love these images for digital stamps and embroidery like red work. They are clear and precise and easy to use. 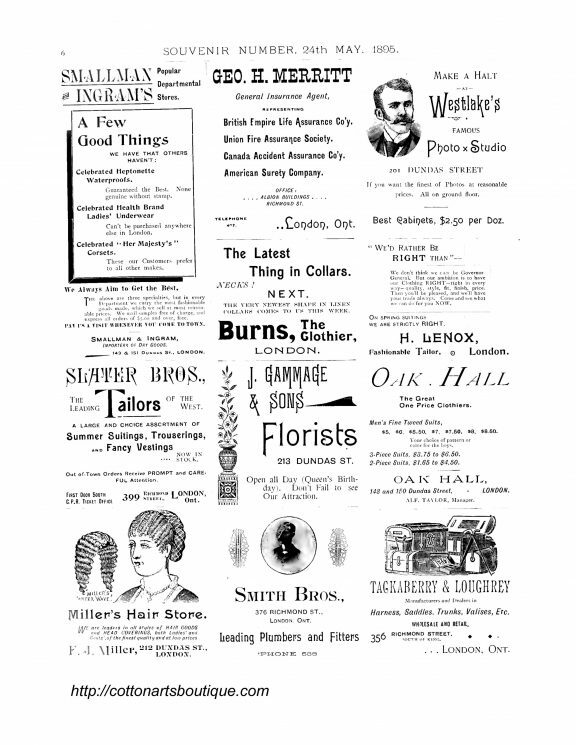 This page of ads would make a great background for your vintage art. It could also be transferred to a pillow or framed as a poster for your country kitchen wall. Another set of images at 300ppi to use in your art. 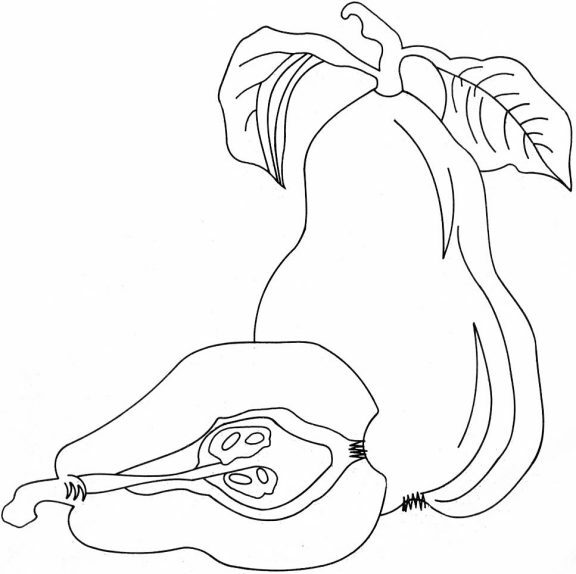 You could use them as digital stamps or embroidered on a quilt square in redwork. 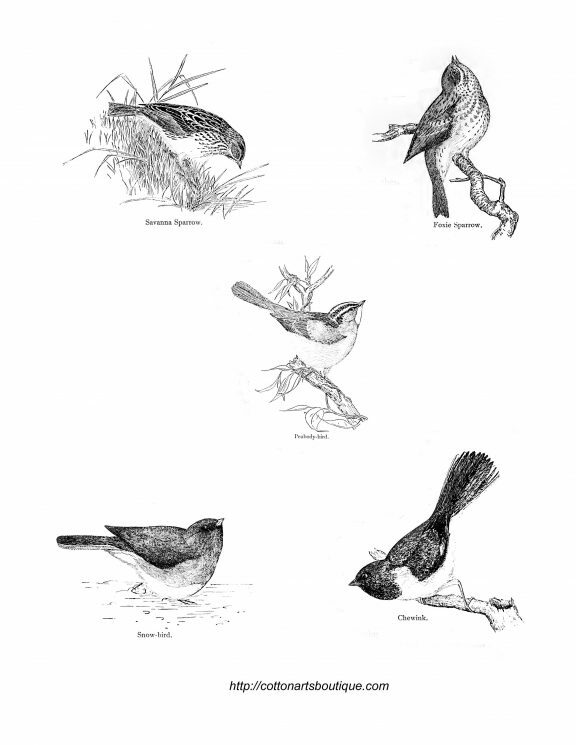 They could be coloured and used as a transfer onto your fabric, remember to reverse the image if you keep the bird name in the image. Santa …. two great images just in time for Christmas card and tag making. 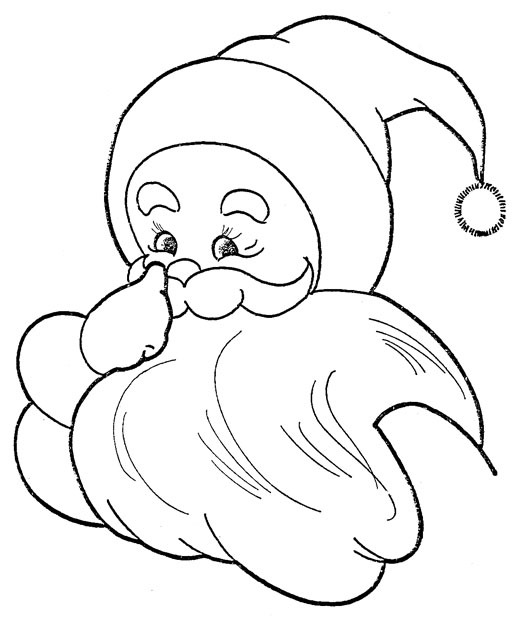 These vintage colouring book Santas would also make great embroidery patterns for tea towels to give as a hostess gift. If you quilt but don’t embroider you could applique him onto a towel as well…even a Christmas stocking. Done on a fabric postcard he could be sent as a Christmas greeting too. 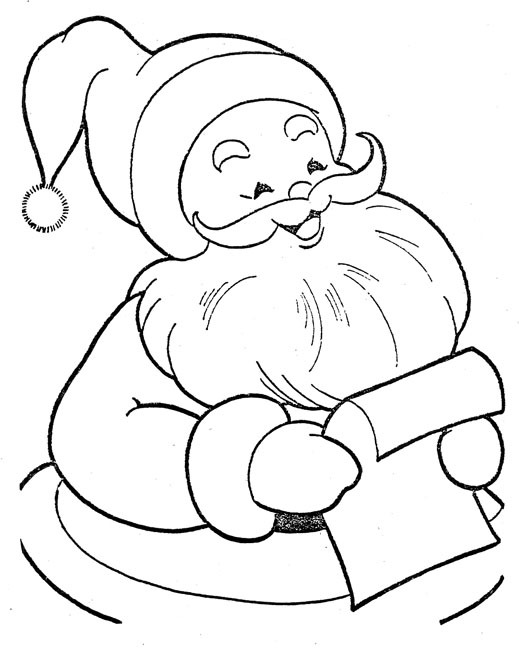 Santa checking his list. At least he is laughing so he must like what he sees. This is the pattern I used for my pear card …. it was published in the McCall’s Needle Art magazine Vol IV. It and a sketch of apples were included. 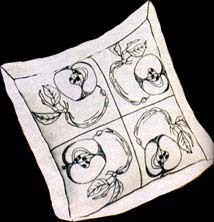 The apples were used to create a pretty decorative pillow that would hold up on your couch today. These vintage patterns lend themselves to so much more. I love to honour them and their creators by using them in what I do today. This pillow would look just as great on a dark homespun and stitched with white cotton or one of each light and dark for contrast. Done on ecru or white homespun and framed it would look perfect on a kitchen or dining room wall. Both sketches could be used as a quilting pattern in a solid coloured block in your quilt. Wouldn’t that look good on your love seat?